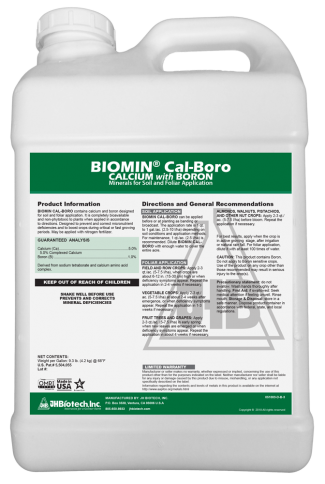 Biomin Cal-Boro is indicated when Calcium and Boron levels in the plant are below desired levels and need to be quickly restored to optimum. Calcium and/or Boron deficiency in plant determined by test, observation, or known nutritional needs of certain plants and/or systems. Biomin amino acid chelated Cal Boro provides easily absorbable and “plant friendly” Calcium and Boron for immediate use by the plant. Another Biomin product, Cal-Boro Light (5% Ca, 0.5% B), is generally recommended for the normal maintenance needs of most crops. Cal Boro (5% Ca, 1.0% B) is recommended in certain situations where additional Boron is needed. These are critically important nutrients for pollination, leaf growth, fruit formation, disease resistance and shelf life.